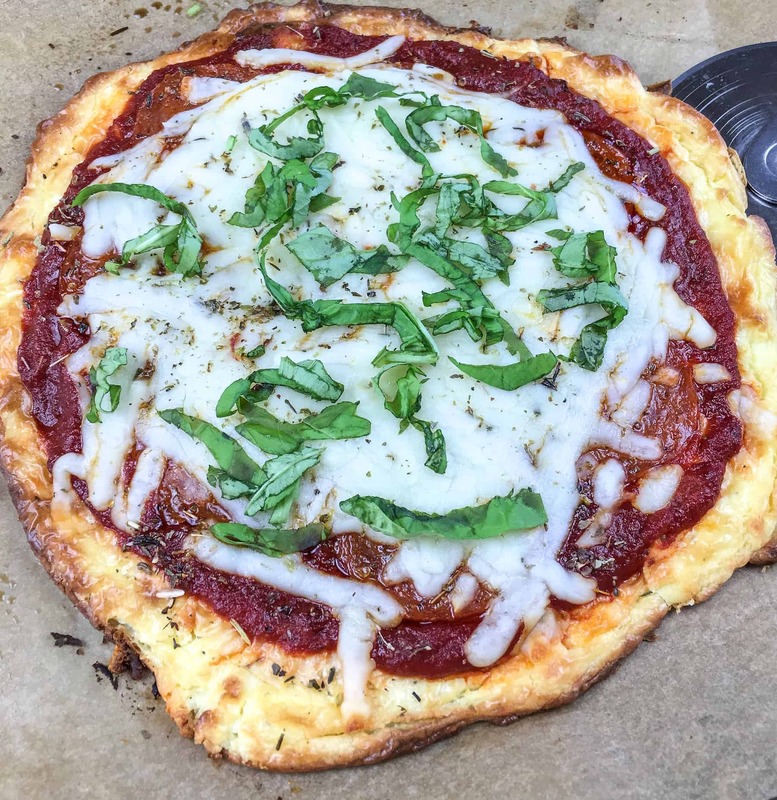 This recipe is a tad different from the Keto Fat Head Dough Pizza recipe as this Keto Basil Pizza Recipe has mainly cream cheese as the main ingredient. 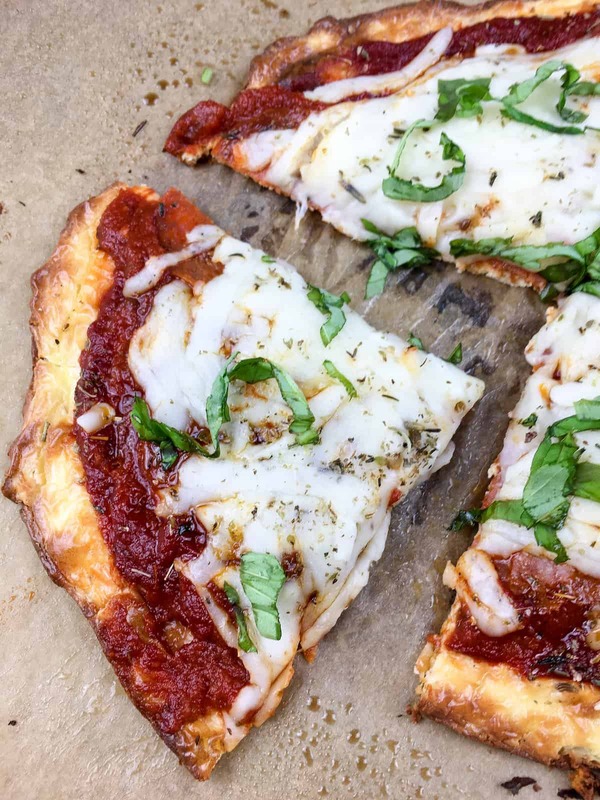 I love trying new recipes and this is a great way to enjoy pizza that doesn’t taste the same every time you make it. Plus, the fresh basil on top puts this recipe in the drool category! It’s definitely a family favorite! The sauce can be the trickiest when you are looking for a sugar free red sauce option. I tend to buy Rao’s. 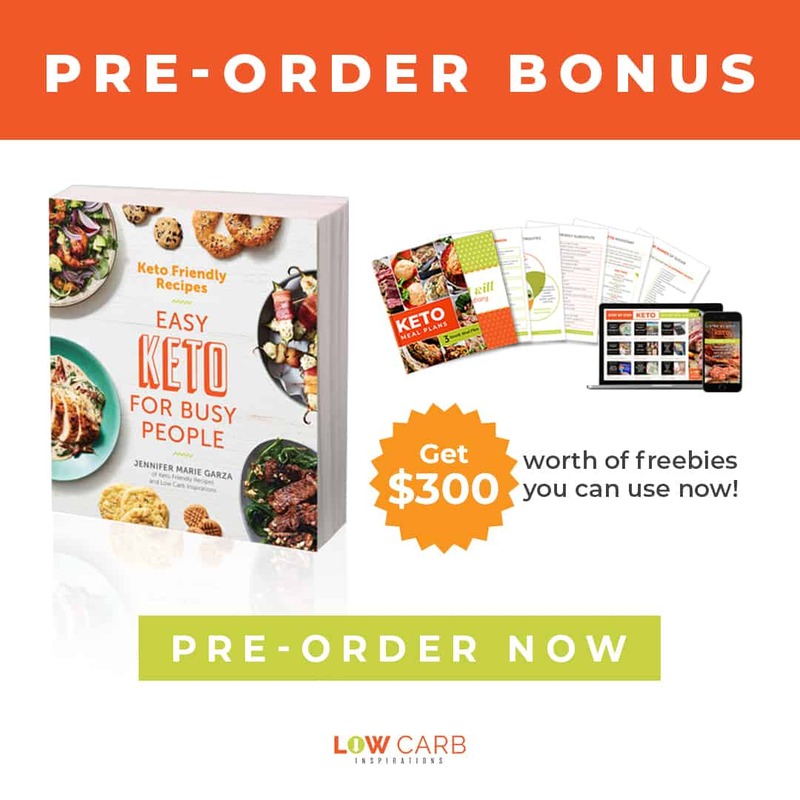 It’s hard to find local and it’s not cheap but it fits my goals and I really don’t use a whole lot in the recipes I make. Here’s a frugal tip for you. When you open a brand new jar of the expensive Rao’s sauce, pour the leftovers into ice cube trays and freeze it. I try not to use more than a cube at a time and this will last a very long time when you get in a habit of doing this. Then that expensive jar of sauce doesn’t seem all that pricey after all. • Preheat oven to 375° F and line a large rimmed baking sheet with parchment paper. Set aside. 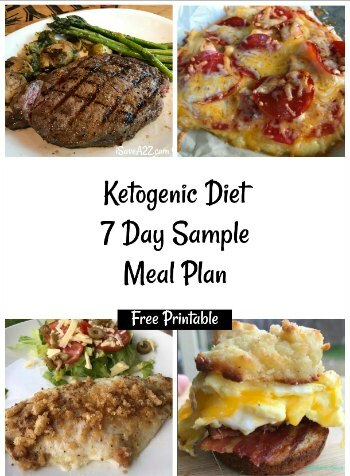 • Combine cream cheese, eggs, Parmesan cheese, 1 teaspoon basil and oregano, and ½ teaspoon garlic powder in a medium-sized bowl. Season with salt and black pepper, to taste, and whisk until mixture is completely blended and smooth. 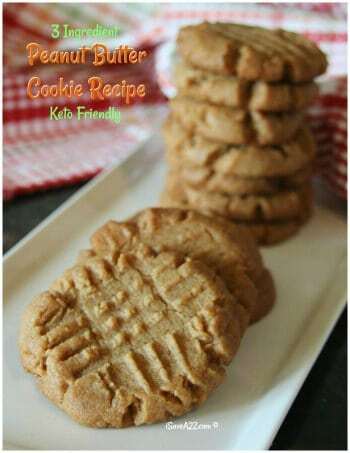 • Spread the cream cheese mixture onto the prepared baking sheet into the desired shape and thickness. (For thicker crusts, reduce oven temperature to 350° F and increase baking times for best results). • Place the crust in the pre-heated oven for 8-10 minutes, or until slightly puffed and golden brown. Check halfway through cooking time to ensure the crust bakes evenly and does not become too brown. • In the meantime, whisk the tomato paste, tomato sauce, the remaining dried herbs, and the garlic powder in a small bowl. Lightly season with salt and black pepper, to taste, and stir to combine. Set aside. 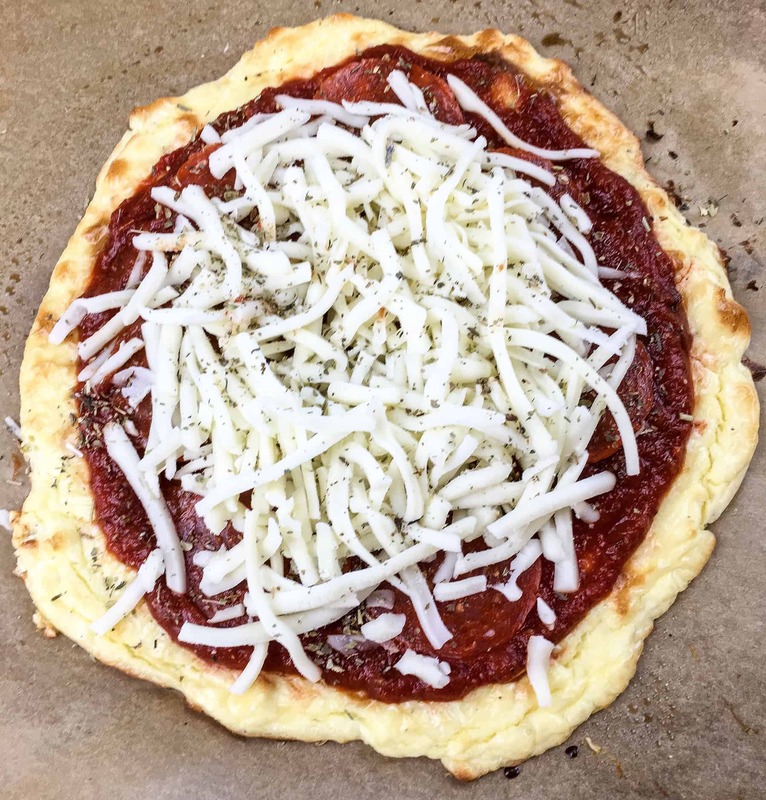 • Remove the pizza base from the oven and let cool for 5-10 minutes before topping with tomato sauce, optional sliced pepperoni, and shredded Mozzarella cheese. 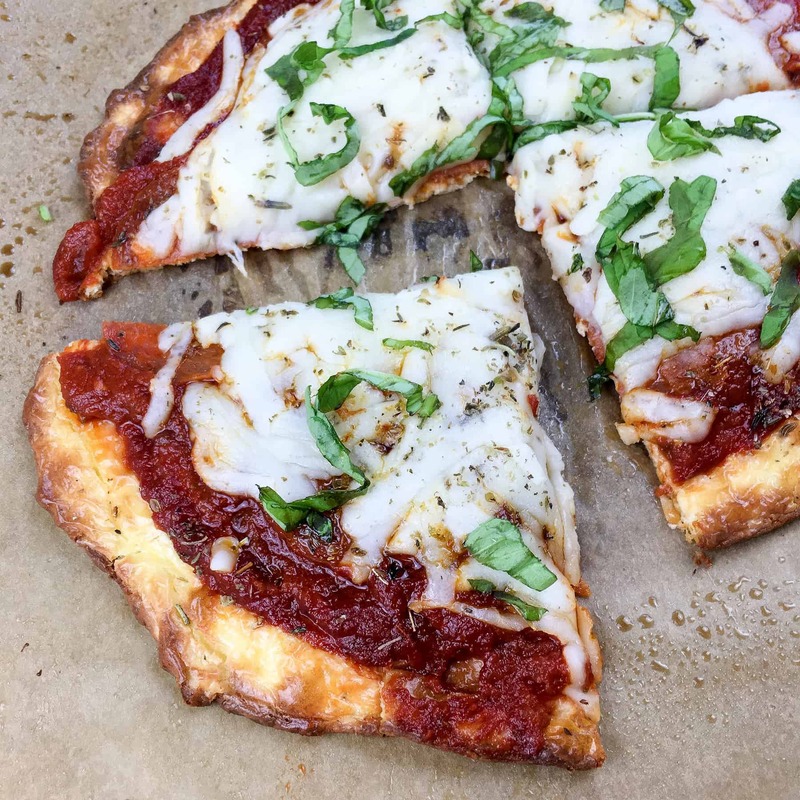 • Return pizza to oven and bake for another 10 minutes, or just until the cheese is melted and bubbly. Remove from oven and garnish with fresh basil, if desired, and serve immediately. 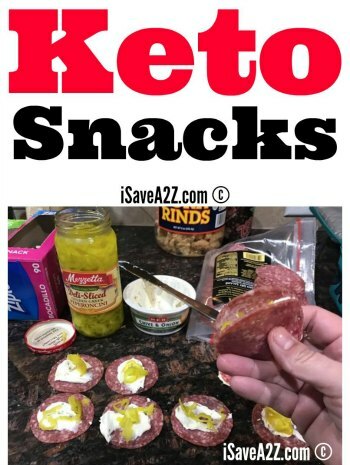 By Jennifer on December 13, 2017 Keto Appetizer Ideas, Keto Dinner Recipes, Keto Friendly Recipes, Keto Lunch Recipes, Pizza, Recipes, Weight Watchers.